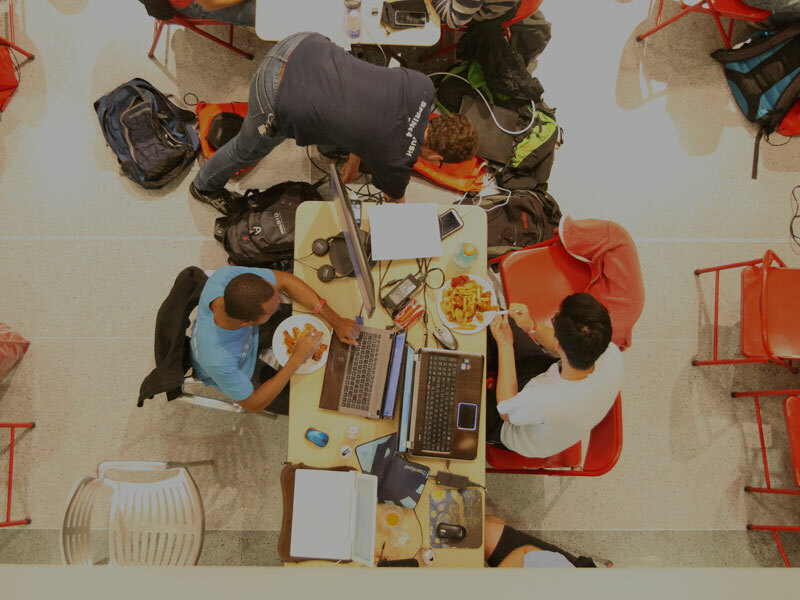 Students participate in Cornell University’s first-ever student-run hackathon, BigRed//Hacks. Over 300 students from schools throughout the northeast gathered on September 26–28 to take part in Big Red//Hacks, Cornell University’s first-ever student-run hackathon. Hackathons are events where programmers, engineers and others work intensively on producing software programming, apps and startup business ideas within one weekend. According to a survey by student hackathon organizer Major League Hacking (MLH), 58 percent of hackathon participants received offers for internships, full-time jobs or part-time work as a result of attendance. “Companies are starting to recognize that hackathons are a very powerful recruiting and marketing opportunity because developers are in such high demand,” Jonathan Gottfried said, co-founder of MLH. Siya Raj Purohit, project manager online computer science education site Udacity, said she’s noticed a cultural shift in the post-grad recruitment process. Universities used to get paid by companies to allow them to recruit their students–now those companies are investing in student hackathon projects. Leon Zaruvinsky, the co-director of Big Red//Hacks, said he wanted to bring a hackathon to Cornell to fill a void. According to MLH, more than 40 hackathons will take place across the United States, Canada and the United Kingdom this semester. “They’ve become a place to learn real world practical skills. You might learn the theory in the classroom but you learn practice at the hackathon,” Gottfried said. MHacks, the fall 2013 University of Michigan event, was one of the first large-scale student-run hackathons–breaking the record at the time with 1,200 participants. Rajagopalan said they became popular around that time. Hackathons provide unique opportunities for student “hackers” to imagine, create, collaborate and produce projects. They also get students hired. Anthony Rotoli, a Microsoft recruiter at BigRed//Hacks, said the best way for students to get noticed by employers is to attend events like hackathons. “At a career fair, we walk away with a stack of like 500 resumes, but at an event like this, we might walk away with 5 or 10 people that that really impressed us,” Rotoli said. Rotoli wasn’t allowed to release exact numbers on how many students Microsoft hires from hackathon events, but he did say that the company hires well over 1,000 full-time employees and 1,000 interns yearly. Although hackathons offer students career opportunities, they aren’t limited to corporate employment. Hackathon culture provides an entrepreneurial atmosphere many students find lacking in their computer science curriculums. “When you get a bunch of passionate people willing to throw away whatever else they were doing for the weekend and isolate themselves for 36 hours to build things, you get amazing results,” said Rajagopalan.